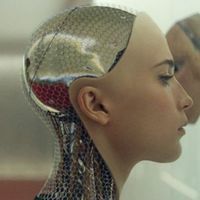 Do yourself a favour and buy, beg, borrow (don't steal) the movie "Ex Machina". Don't watch any trailers, don't read any articles, and don’t even read up on IMDB. Just trust that if you have any interest whatsoever in what it means for a machine to be self-aware - this is the movie to watch. I'll just say it does a brilliant job in exploring the philosophical repercussions of the Turing test. For me it filled the void left by my expectations of "The Imitation Game", and then some. It is the sort of movie that will be spoiled by the trailer, and I watched the trailer afterwards and thought it made some of the dialog sound real cheesy - so don't do it. Immerse yourself then give yourself time afterwards to process what went on. I've been thinking about it for days. I heard about it through one of my favourite podcasts, and they do an interesting breakdown review in SGU Episode 515, if you want to hear a great deconstruction. I'm so pleased you liked it. I thought you would, but you never can tell. I think it was bang on the money too. I love films like this. There is lots of room to breath and every scene is amazing to look at. I am glad they at least explored that particular thread when he was assessing himself in the mirror. Could have gone a number of ways a few times I guess. If you enjoyed that, I hope you are watching the C4 programme Humans! Worth checking out Black Mirror if you haven't heard of it also. The UK produces some good stuff, I'll have to check them out, cheers.